5:30am - 11:30am break. Mon. - Fri.
11:30am - 2:00pm lunch Mon. - Fri.
5:30am - 1:00pm Break. Only Sat. - Sun. Open 364 days a year Closed Christmas day! This place is AWESOME! Food was great and the service was excellent. It has a comfy atmosphere and I will definitely be back there the next time I'm in Framingham. I don't know what's wrong with the other reviews, but I love J & M. I've been going there for years. Always delicious consistent food and all the people working there are so friendly. I think it's the best Diner around! What a bad service j&m dinner! Tuesday its even worse... waitresses dont know what they're doing! All you hear is the cook screaming "pick up please" and you see your food ready to be eated waitting on the window for minutes and when the kids go to get it and bring it to you, it is already cold! To be honest? the food is good so conglatulations to the cooks but the service? socks! I go there every tuesday and sunday. Tuesdays the food is great but the service is ridiculous. Sundays the food is not so good as tuesdays (maybe because its week-end)and service? no comments. I love the food on tuesdays but seriously? I'm thinking about changing my breakfast to another dinner. Not easy for an old fellow like me that has been going to j&m for years! a diner from Wayland, Mass. Best in Metro West and come hungry! Don't hang around because this is a place where people from all over are waiting for your seat. This diner is a well kept secret and most don't want anyone to know. Breakfast is the draw and the homefries are the best. Same staff, family owned and operated, pajamas? Yes the staff wear pj's. Loyal following even in the early morning. We just love it!!!!! I was there today and my homefries were delicious as always. Even from looking at your picture, I would have eaten them ALL up. By the way, try their steak, cheese pepper omelets. mmm my favorite! Yuuum!!! They look good just the way I like them well done. You cant please them all, but they do please a lot of people, for years! Ridiculous! A simple problem, my homefries were burnt. I complained, the girl said that that was how they come. BTW, they were not like the ones in the picture above! She gave me a story about how some potatoes are smaller than others. So after the meal I shower her the pile of burnt H/Fs and asked her to take the $1.25 off the bill. She argued, then took .50 cents off. I told her I was not paying the extra .75 cents. SHE CALLED THE COPS ON ME!!! I paid the extra just so that the cops could get back to work. Funny thing is that it was not about the money, it was about customer service and satisfaction. If that girl had taken the full 1.25 off the bill with no argument I would have left a $2.00 tip. So who lost here? They did. They were out a net of .75 cents and have lost a customer. This is what happens when you leave children to run your business when you arent there. What if this had gotten in the paper? 3 cop cars because of a dissatisfied customer!! 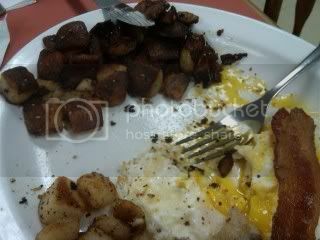 BTW, I took a pic of the H/Fs Here is a link to a picture of the homefries - YOU be the judge! a diner from Framingham, Mass. Don't let the lines fool you. This place turns tables so quickly and if your willing to take what ever is available as far as seating, you will be seated first. The food is great, served fast and hot, no heat lamps here! We were just there this past weekend same crew, menu, food with the owner behind the grill and like it says on the menu "the way things used to be". The good news is that nothing has changed here and it is still the best!!!! Like the last post says "the lines prove it". J&M is still good if not better and the lines prove it. I have tried almost everything on J&M Diner's menu and loved every bite of it. When I'm lucky enough to get the day off work and have their delicious lunches, I'm in heaven. No one makes a Turkey Rueben like them. I have had their Reese's Peanut Butter pancakes and loved them, especially with bananas and whipped cream on top. You can't cater to every allergy that's out there. I've never seen such a clean restaurant in my life. The staff is energetic and I no matter how long the wait, I feel it's always worth it. Over the years, restaurants have come and go. They must be doing something right, because the owners even work there. I've even seen their kids work there too with big smiles on their faces. Keep up the good work. It would be a shame to miss out on such a gem! It's too bad, the place used to be good and in the last year has gone downhill. The food now tastes different...either they are using frozen or canned veggies now. The portions are huge, but guess that is why they are so overpriced. I went to a competitors diner a couple weeks ago and ordered an omelet with veggies, ham, and cheese with raisin toast, coffee and orange juice. My whole bill was $8.40 and I even got a slice of melon on the plate. I tried to order the same here, but could not as they would not allow any substitutions in their omelets. I settled for the closest thing on the menu which between the omelet and the home fries filled the plate with salt and grease. Adding coffee and juice my bill was now $14 which was definately not worth it. On a sympathetic note, while I was there as I was sitting close to the door I overheard a conversation between a staff member and a potential customer. This customer had children with nut allergies and because of the idiotic concoction that the chefs came up with of Recees peanut butter pancakes, the entire grill was contaminated with the possibilities of peanuts and this woman could not bring her kids there to eat. In a way, she was better off as the food was not worth the wait or prices. On the other hand, I am sympathetic that kids have to eat and as the woman stated "I have been coming here for years and NOW you make it unsafe for anyone with nut allergies" as she left with a whining child. My suggestion, don't waste your time there are much better places to start your weekend with indigestion. I have no Idea what that negative reviewer is talking about. Just last time I went there I got eggs benidict with no ham...no one gave me a hard time. I am a vegetarian and I have been going there for a year and I have had no problems whatsoever. As far as the food being homemade, i still think it is, but if its not, I don't really care because its damn good! a diner from Framingham Mass. Lies Lies Lies!!! I was there the day they let that transient employee go one morning. I have seen this person around town at other business and it was just a matter of time before they let her go, they just dont put up with that kind of character for too long. The food and service is the best and they know your name or at the very least what you eat! Keep up the good work and what a coincidence that the date of the Ashland post is the day of the occurrence. I can't believe someone would just tell absolute lies on this thing! J&M is fresh and homemade. I am there all the time I love it! Someone must have been having a bad day! What a shame and with everything that couple that owns the diner has been through this past year. We make the trip from Holliston every weekend and can only dream of having a family owned & operated diner in our own town that has been going strong for a decade! J&M is not for everyone but they have quite a loyal and rather large following. There will always be that one diner out there that just doesn't get it. the post saying all that crap about the diner is complete BS! The pancakes come from "just add water" boxes. The hash is straight out of a over-sized Sysco can ... I could go on and on ... Even their eggs come out of pre-mixed bag. Patrions are allowed NO (NONE) substitutions, for example ... Eggs Benedict No Ham Add Tomato is frowned upon. (Beware vegeterians) But if Dave the "Cook/Owner" is in a decent mood (barley ever) he will make it clear to charge $1.00 per slice of tomato for the change, even though you are not receiving the ham which is where the cost lies in this extremly overly lemon flavored dish. All in all the food is ok, the portions are HUGE, but I just wanted people to know that they are not getting what the asked for. Homemade food.